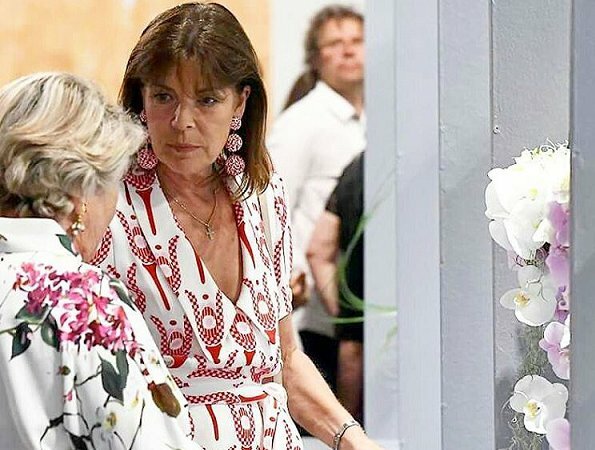 Princess Caroline of Hanover visited 50th International Bouquet Contest (Concours de Bouquets) held by Garden Club at Monaco Fontvieille Park. Since the year of 1968, Monaco Garden Club has been holding a bouquet contest every year among 100-150 contestants including those coming from distant countries. Garden Club is a non-profit organization established in 1968. 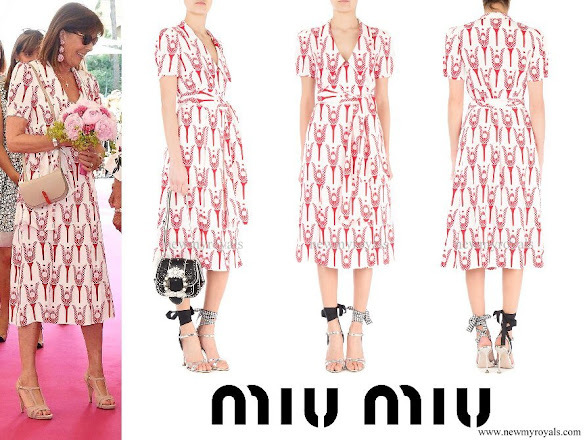 Princess Caroline wore a printed dress by MIU MIU. 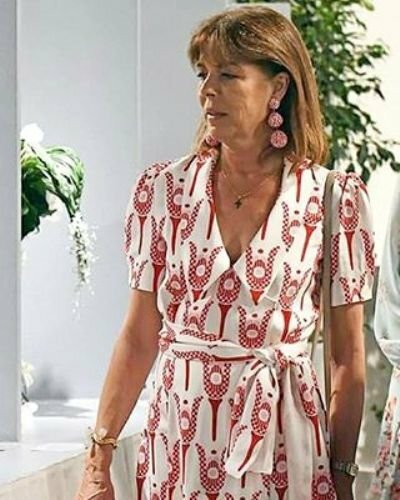 Dear Caroline, I love your summery outfit! As far as I can see, we girls are aging. Some of us more, some of us less. I like you more in these days than in the 80'ies or 90'ies... Live teached us many things and lessons, right? (b.t.w., cut your hair 5cm, it looks better...) Magnifique! De cette tenue, j'aime tout, tout tout tout! That dress style and print is lovely, just perfect for a summery day. I like the cute matching earrings, also. Princess Caroline is looking a bit overly sun-kissed with quite dry skin. She always seems so calm and confident, not fussy. That's a pretty dress. She looks good in it. Nice color, nice print. Love it - elegant, summery Monegasque colours. The accessories are great too. I like the hair this slightly lighter colour with the fringe but it definitely needs a trim! But she's fabulous anyway. Yes to a hair cut. And Caroline seems to be stuck with the late 80s hairstyle. It´s time to move on. Please - less frizz, less hairspray, no more centerpart+fringe. In the first photo, she looks a lot like Stephanie. What a lovely summer dress - the colours, the print, the style. She looks elegant yet relaxed. The outfit and accessories are on point but the hair definitely needs to change. The dress looks nice but her cleavage not. Her taste is always impeccable. 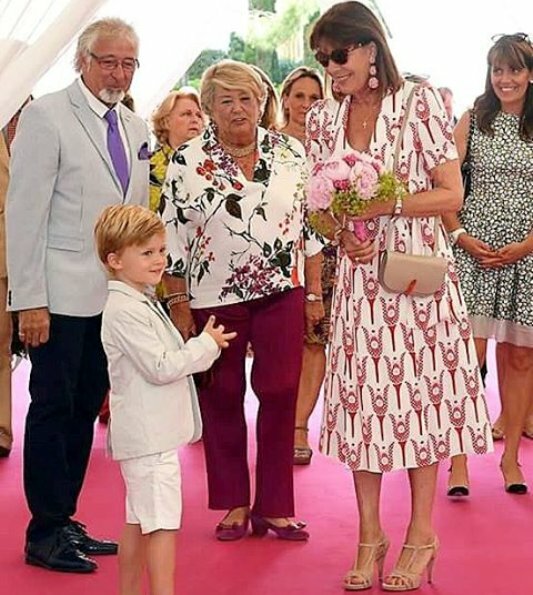 She is one of few royals knows how to dress. I love her dress and accessories!! So pretty and complimentary!! Once, one of the greatest royal beauties. She is still an elegant and beautiful lady. I like her outfit a lot.